Our local ice rink has an amazing offer for home educating families, who can use the facilities one day a week, on days when other children are still in school. The rink was recently taken over, so the new owners are now also offering classes for home educated children at less than the price of a cup of coffee. An uncanny thing about children is there amazing memory. A few months ago the rink was going to be closing down, and Ameli wanted to learn to skate. I told her that if they found a way of saving the ice rink, I’d sign her up for classes. When the press broke the story, she wanted to be first in the queue. Fast forward two weeks, and we arrived for the lesson today and she was so afraid (despite have skated once before, earlier in the year) that she was crying. Forty-five minutes later and she was pushing a penguin around on the ice like they were old friends. While your body may not remember the way to move forward, and pregnancy and breastfeeding have left you with no sense of balance, your limbs have muscle memory, or something, as you can feel a sprain from 20 years ago flare up every time you see someone else fall over! Sometimes, some things just aren’t for you. I love the idea of gliding gracefully on the ice with the cool air-conditioned air blowing through my hair. But my arches are high and every ounce of pressure from my body focusses itself on the bridge of my feet and after two minutes I want to scream in agony – I had two home births, one with a 9lb 9oz baby. I can handle pain – but skating in rigid hire boots hurts, hurts, hurts. Some things you can’t just push through, and you have to accept you’re never going to be an Olympic figure skater. And that’s okay. You will never succeed if you don’t try, and if you try, you may actually like it. If you try and you fall, get up quickly, otherwise you end up cold and wet (or some other otherwise that’s more relevant to real life.) The point is if you stay down, it takes longer to sort yourself out when you finally do get up again, and while you might succeed and never fall again, for a time at least you’re going to carry the consequences of what happened while you were fallen, in this case, being wet. If you let go and find a suitable support you can go anywhere, and achieve almost anything. Ameli raced around the ice after and with the older girls who all skate quite well already, pushing her penguin at impressive speeds. She had fun with her friends, by letting go of the sides with the right kind of something to lean on. 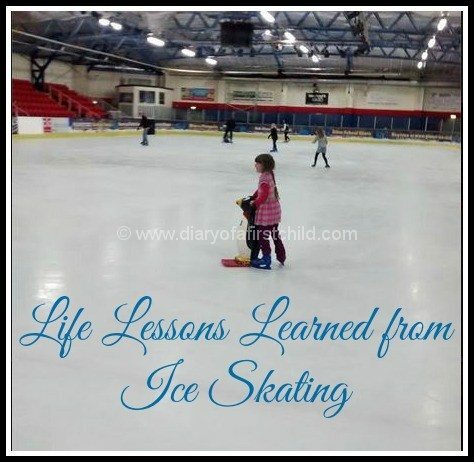 While it’s easy to walk on the mats with skates on, it’s no where near as satisfying as gliding on the ice, and as long as you’re on the ice, you’re learning to skate, gaining confidence and improving your skills. Life is much like this. Sometimes it’s easier to be somewhere comfortable, and it can feel like the safer, easier option… but that’s not where you’re growing, developing, improving, learning to shine. Well, maybe she doesn’t know that she learned any of this today. Maybe she just had fun and maybe the lessons were mine.